The Former President, Olusegun Obasanjo, has denied the allegation that he is supporting the re-election bid of President Muhammadu Buhari. In a press statement by his media aide Mr Kehinde Akinyemi on Wednesday in Ogun State, he described the report as malicious and unfounded. Akinyemi said his boss was neither in Abuja on May 1 nor does he own a house in the Federal Capital Territory, as he usually stays in a guest house or hotel anytime he visits. The media aide maintained that the position of the former president remains unchanged as stated in a statement he issued on the state of the nation in January. According to him, Nigerians know that Obasanjo has only spoken the truth about poverty and would continue to exercise his right to free speech. “In the last 24 hours, the internet has been bombarded with deliberate falsehoods aimed at hoodwinking the unsuspecting Nigerians to believe that Obasanjo has now supported Buhari for his second term because of some perceived Buhari’s ‘superlative’ performance in his encounter with (U.S. President Donald) Trump during his visit to the White House in Washington D. C.
“From the Buhari/Trump meeting, Chief Obasanjo only saw through three points: One, the US will continue to reduce purchase of crude oil from Nigeria and there is nothing Nigeria under Buhari can do about; two, the US will export agricultural products to Nigeria and Buhari’s government will encourage that; and three – all the killings taking place in Nigeria by herdsmen are being done by expatriates trained by Gadaffi and no Nigerian is to blame and Buhari cannot do anything to stop it. “For whatever the meeting was worth, President Buhari again bungled another opportunity to self-redeem. 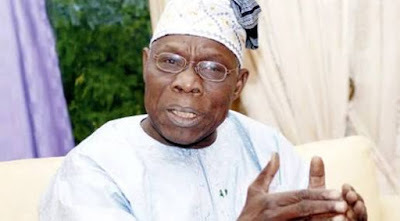 Therefore, Chief Obasanjo is more convinced in his statement of January 23rd and will not change his position.